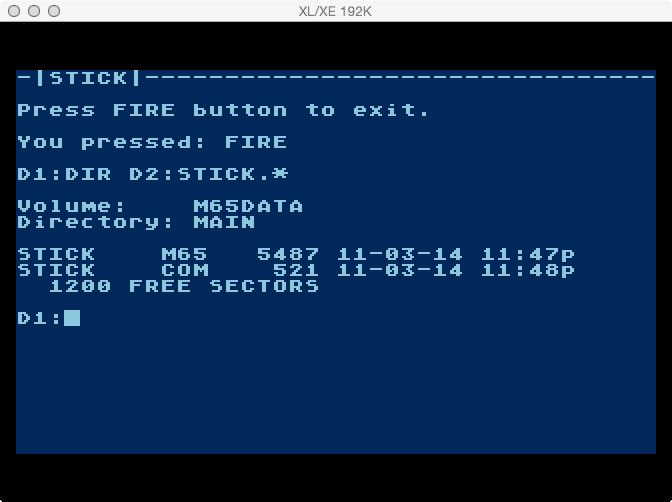 6502, Which way is up? In this post I explore how to read from the joystick. 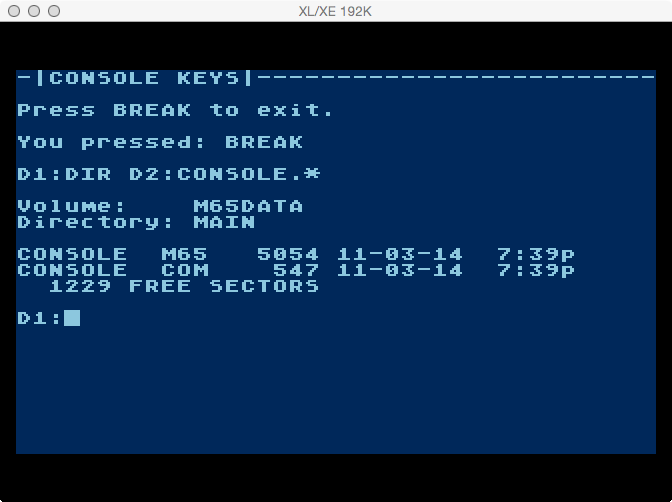 This program is very similar to the one in my last post about reading the console keys. There are some big changes in the decision tree, and of course minor ones in the output strings. The decision tree still uses the BEQ and BNE instructions, but in a slightly different fashion. Due to the length of code to process all the directions the comparisons couldn’t be placed consecutively (CMP, BEQ, CMP, BEQ, etc). BEQ and BNE only allow execution changes up to 128 bytes away from the branch instruction itself. To accommodate I moved each direction handler inline with the compare. The big difference is now instead of BEQ (if the compare equals), I used BNE (the compare does not equal), and the BNE changes program execution to the next direction handler. This effectively keeps each branch at a minimal distance away. As with last time, I added to my A8 Assembly library to support the joystick. Just the additions are listed. 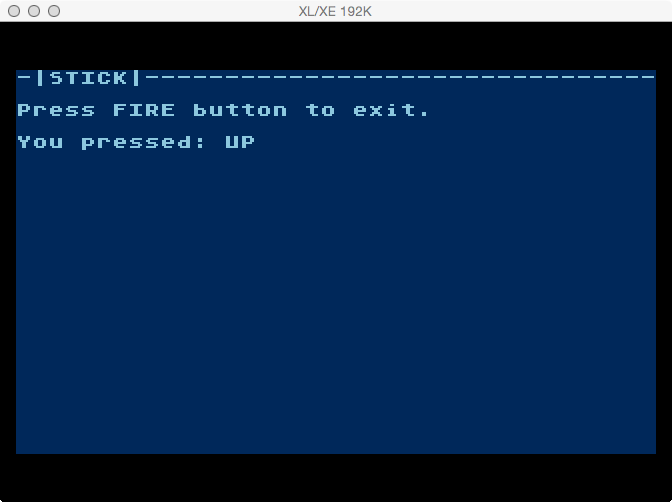 10 .TITLE "Stick, Version 1.0"
Since the program is fundamentally the same as the console key program and the code is documented fairly well, I will just document the decision tree. 534: Store the accumulator in location IDIR. The accumulator will change before we have a chance to check it. This is the direction the joystick was pushed. 2100-2130: End of program routine. Turn cursor back on and exit. The source code is again around 5K in size, but assembles down to just 521 bytes. 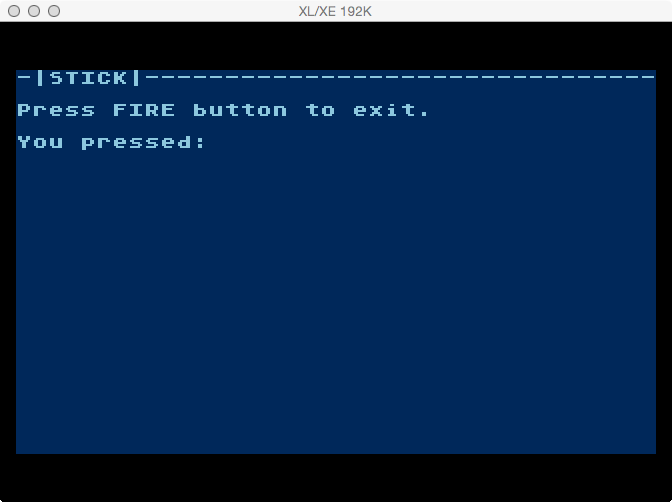 6502, OMG You Pressed It! I decided I needed to learn to check for console key presses before moving onto to what I imagine will be much more difficult subjects like graphics and sound. So here it is. 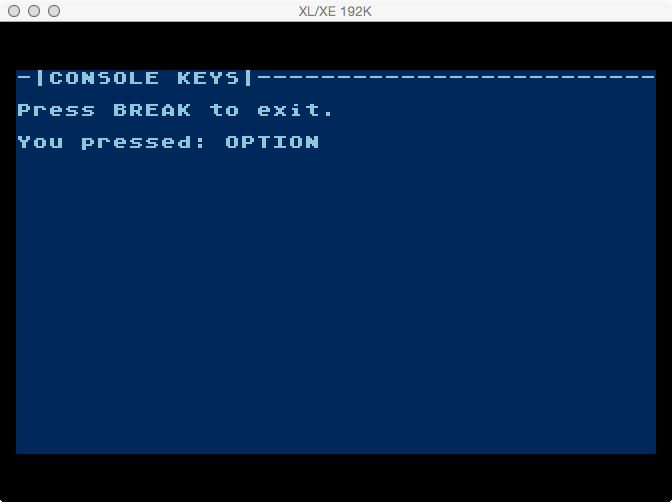 I wrote a smallish program to check for presses of the common console keys (OPTION, SELECT, START), and combinations there of. 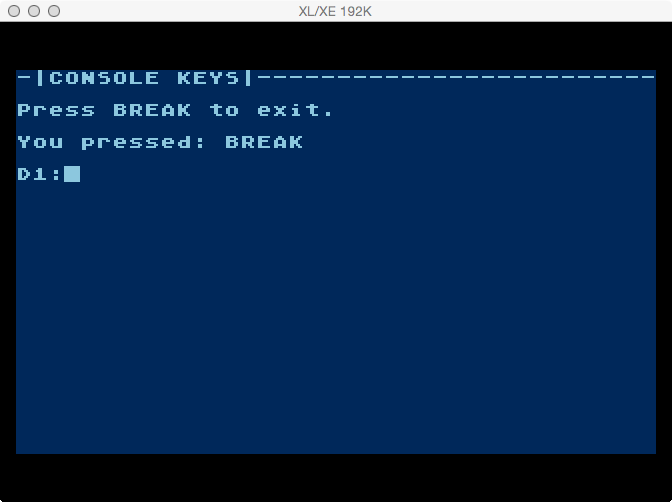 In doing so I also added a check for the BREAK key, though it’s not technically a console key. 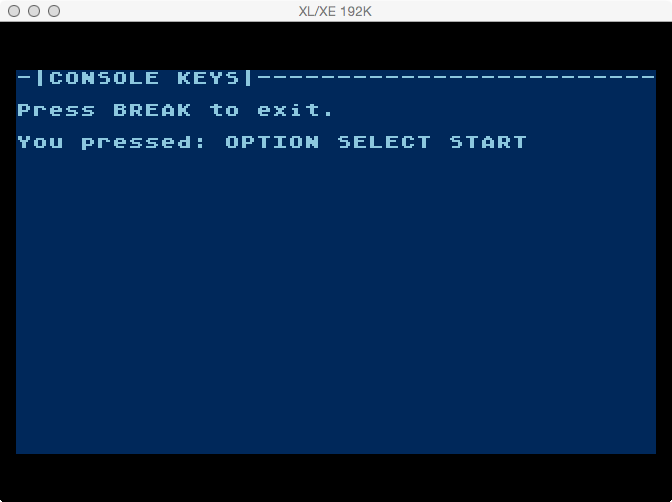 In addition, for XL/XE systems, it will check for the added console key HELP. To support this program I added a few lines to my A8 Assembly library. Here is the updated library. 1020,1022: Added initially as I was going to write a custom BREAK handler, but ultimately didn’t need to. I left them in anyway since they may come in handy later. 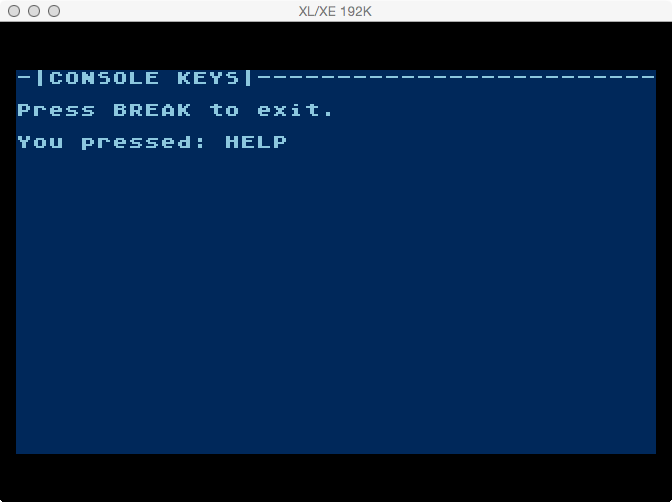 This is the source code for “Console Keys”. I used ASCII line drawing characters instead of ATASCII drawing characters to simply code listing on the blog. I named it “CONSOLE.M65”. 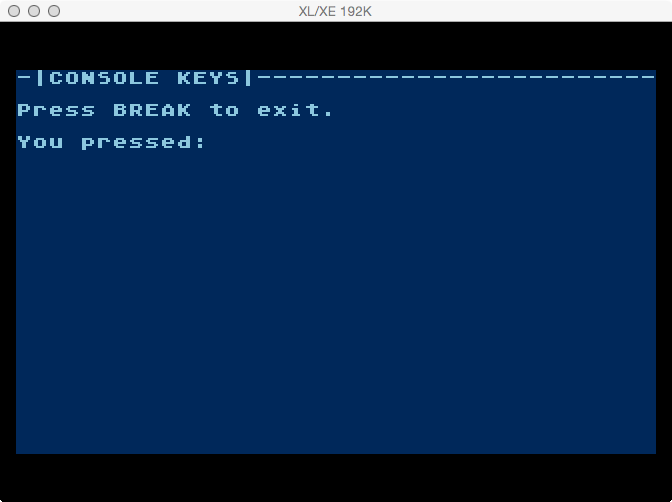 10       .TITLE "Console Keys, Version 1.0"
The code is documented pretty well. I will break down the pieces that are important for this program, which is mainly the press loop (PRLOOP). 200-416: Set margin, turn the cursor off, print the display text in the right spots. 568: Store the value into location IKEY. This is because the value in the accumulator will be changed by the time we actually need to check which key was pressed. 570: Compare the accumulator with value CONNO or 7 (7 means no key was pressed). 580: Goto the start of the loop to check again. No keys were pressed of any kind. 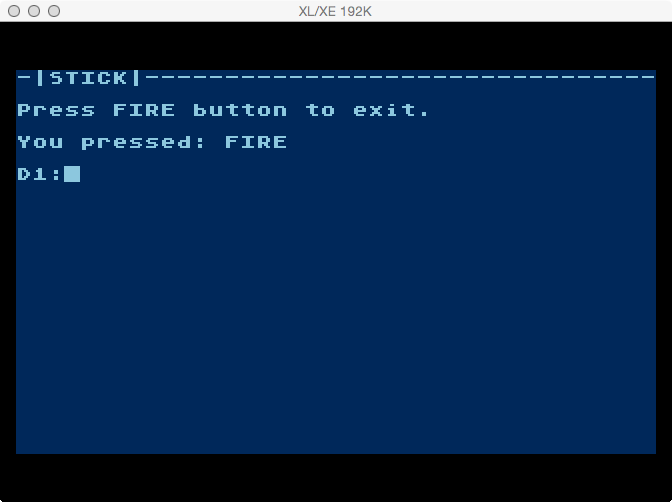 612: Call the clear text subroutine to remove what was on the screen before this press. 965: Goto PRLOOP to check for a key. Technically this should never be reached since all possible values of the CONSOL register were checked and conditioned for. 1000-1748: The subroutines for each key press and key press combination. 2500-2540: Clear output text subroutine. 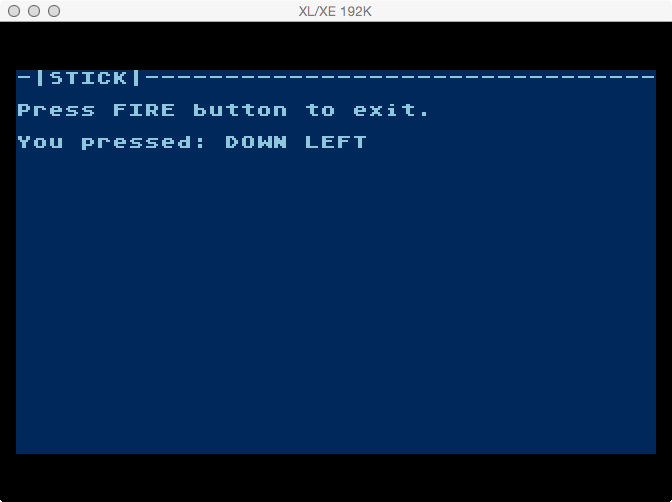 Positions the cursors, prints the blank space, then repositions the cursor for output.